Size: 53" x 53" x 10"
Mixed media: vintage rice bag, silks, wire, waste canvas, Asian food wrappers and reproductions of Japanese interment tags, mini shoyu bottles, cotton thread, and fortune cookie strips printed with snippets of Executive Order 9066. Currently in the studio of the artist. 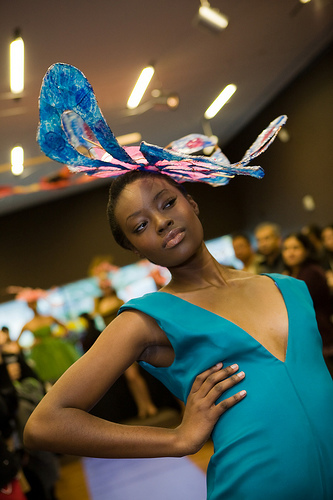 Originally created for de Young Museum Artist Residency. Kimball Education Gallery. December 3rd, 2008 -January 4th, 2009. Size: 55" x 59" x 16"
Mixed media: silk remnants, Japanese ear cleaners, wire, waste canvas, Asian food wrappers, mini shoyu bottles, produce netting and cotton thread. 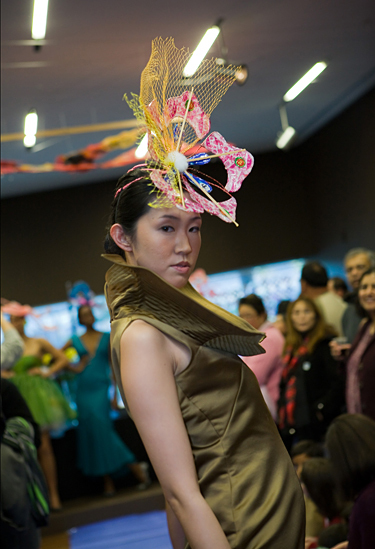 Miho Urata wearing Bronze Silk satin Les Jolies Fleur Dress by Colleen Quen and Small Blossom Hat by Corinne Takara. Hair and Make-up by Armando and Christopher of Get Your Do Up! Mixed Media: wire, silk remnants from Colleen Quen Couture, flour bags, waste canvas, fishing floats, sushi grass, Chinese and Japanese food wrappers, Chinese cording and produce netting. The background imagery of this piece is inspired by a Japanese print in the de Young Museum's online textile collection as well as by vivid memories of childhood visits to Maui. I used recycled netting to simulate the window screens upon which clusters of moths and butterflies clung to at night. I have happy memories of Asian fireworks exploding on the warm asphalt roads on New Years Eve. My father called these fireworks by the Hawaiian pidgin name Papa Hu. My favorites were the ones that reminded me of exploding flowers. I have tried to capture the exploding flower bursts here in the red produce netting attached to the ends of the ume (plum) blossoms.